Mobikwik is online recharge site, which provide best cash back on online recharges. Here we are discussing some best offer and their details. Rs. 10 cashback on adding a minimum amount of Rs. 100 in your MobiKwik wallet. This offer is valid across all platforms, including on website and can be redeemed only once(for new user). Add Rs 100 to your MobiKwik wallet first before applying coupon code. What you get: 10% discount on all purchases made on eBay.in when you pay using MobiKwik wallet at the time of checkout. 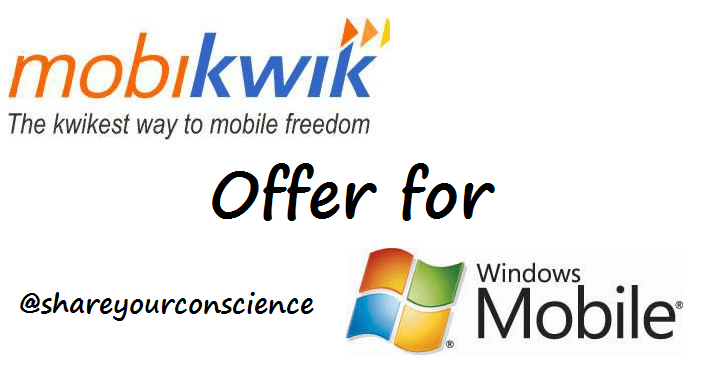 MobiKwik recently launched an offer for Windows Phone users. Get Rs. 60 cashback on adding a minimum of Rs. 100 to your MobiKwik wallet. · First you have to Download MobiKwik app from the Windows store. · Add Rs 100 to your Mobikwik wallet. · Apply the Promo Code: MOBIWP to get an instant cashback of Rs. 60!